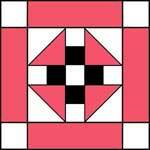 The beauty of the V Block quilt doesn't show up until you're able to put the blocks together. 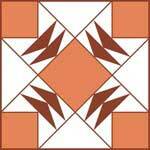 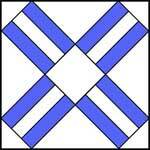 The blocks are	usually placed parallel to the quilt edges to develop a vertical and horizontal pattern. 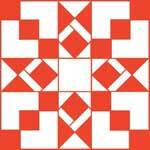 This creates an overlay of designs with ample background areas for quilted motifs and designs. 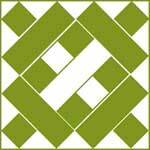 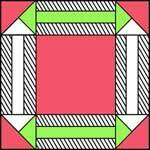 This V Block pattern can be set up in different ways to create various patterns, or the blocks can be alternated with plain colored squares. 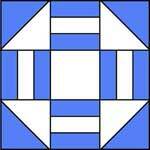 Another variation is to intersperse the blocks with plain colored strips. 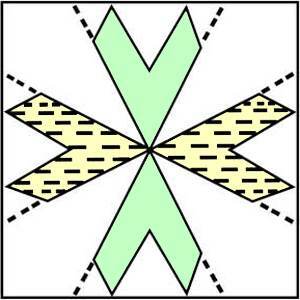 As this fabric is not cut on the bias, a firmly woven fabric should be used to avoid stretching or warping as the pieces are assembled. 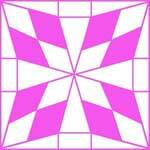 Click on image to print the 5" block of the V Block Quilt Pattern.